Profile Response – Muhidin Libah of SBCMALA, Lewiston, ME | How Will We Live Tomorrow? SBCMALA (Somali Bantu Community of Lewiston, Maine) occupies two rooms on the fifth floor of a tall, aging office building on a corner in downtown Lewiston, Maine. 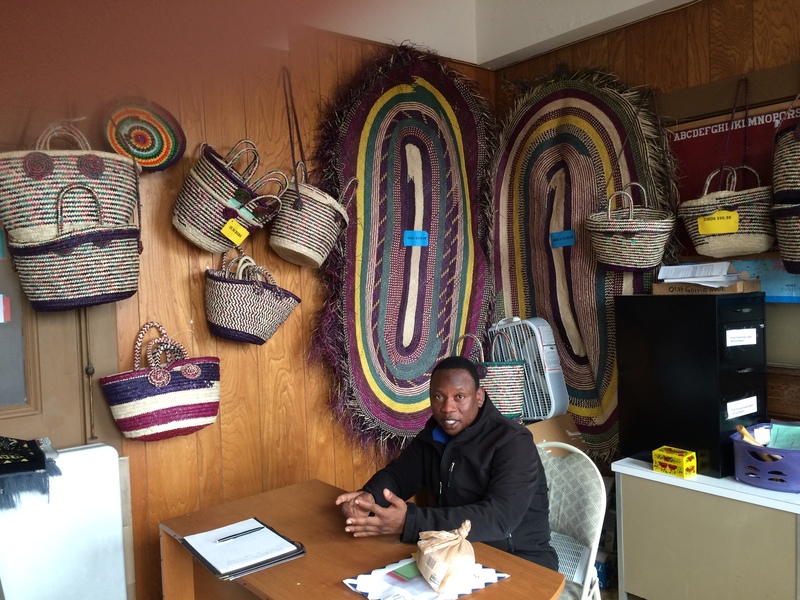 Muhidin Libah, Executive Director shares the back office with the raw materials and finished results of their basket weaving and rug braiding operations. On my way in, a stout woman in a swirling rode and scarf staffed the front office. When I left, a narrow man feeding an infant occupied the same desk. Mr. Libah explained the rank and freedom among various Somali groups. Somali Bantu had been enslaved under colonial rule, and continued to be by ruling Somali after their 1960 independence. In 1999 the U.S. State Department gave Somali Bantu refugees high priority and began bringing large numbers to the United States. By the early 2000’s over 10,000 Somali Bantu had come to the United States, most distributed to larger cities. But like other immigrant groups, they found ways to cluster. Mr. Libah spoke English when he came here. He’s worked at L.L.Bean and St. Mary’s Hospital. He’ll be in the United States ten years this September. He’s a citizen, boasts that he pays taxes, and feels criticism of Bantu in Lewiston is unrealistic. “We have to evolve economically.” He cites increased commercial activity along Lisbon Street, downtown’s Lewiston’s commercial spine, since the Bantu arrived. I cannot compare the street to any previous time, but the commercial buzz on a weekday in May is faint. I cannot help but compare SBCMALA with the Cambodian Mutual Assistance Association I met in Lowell, MA. Cambodian refugees came to that city almost thirty years ago now, and are much more integrated into that place than Somali Bantu are in Lewiston. Time changes so much. This entry was posted in Responses and tagged Lewiston ME, SBCMALA, Somali Bantu. Bookmark the permalink.